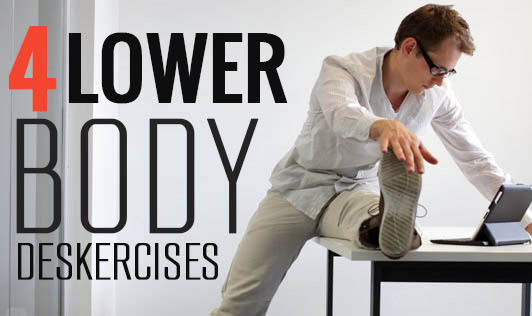 Leg Extensions: Sit upright on the chair and place your legs at 90o angle. Put your hands beside your thighs and raise your right leg slowly keeping your knee straight and foot flexed. You can squeeze your toes too to get a better stretch on the outer thigh region. Repeat this around 15 times and then shift to the left leg. Ball Taps: Make use of the exercise ball. Place it in front of your legs. Sit tall with your tummy tucked in and keep your back straight. Now, lift your left leg and tap your toes on the ball. Lower the leg back to the floor beside the ball. Repeat this move around 20 times. Then shift to the right leg and do the same. Inner Thigh Press: Take a book or ball and place it between your thighs. Press by putting tension on the inner thighs, release very slightly but not completely, and repeat the process at least 25 times. Low Leg Raise: This is a modification to the first exercise. Just raise your left leg slightly above the ground keeping your foot flexed while feeling pressure build up on the upper thigh. Count till 20 and lower it. Go for 20 repetitions on each leg and progress gradually to 30 for awesome results. Though the list is endless, these 4 exercises are the simplest, most effective, and do not require many props. These exercises are especially useful for toning the lower body as they help you get rid of the fat on the thighs and hips when done regularly.